The Springfield (BPAC) meets once every two months on the 2nd Tuesday of that month unless otherwise noted on this webpage. Meetings are open to the public. To read the BPAC Bylaws click here. April 9, 2019 – 6:00 to 7:30 PM, Council Chambers in Springfield City Hall located at 225 5th Street. 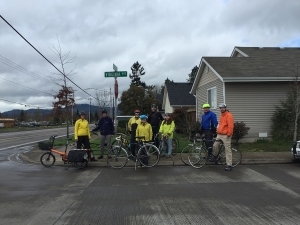 BPAC members and staff touring Virginia Avenue as part of the planning efforts for the Virginia-Daisy Bikeway Project.